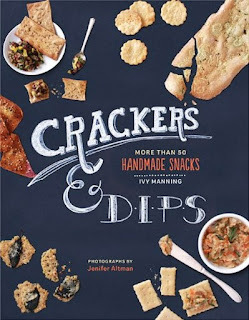 Crackers and Dips- More Than 50 Handmade Snacks is one of those specialty books that will appeal to a lot of home bakers. Homemade crackers give you complete control over the flavors and ingredients and taste wonderful. The author starts by introducing herself, and explaining "snack tooth" which is like a sweet tooth but for savory more than sweet. Then she explains a lot of the tips to make cracker making a lot easier. How to roll out the dough perfectly, and how you can also do pressed crackers or use a pasta machine. She explains how to get a perfectly crisp cracker, how to cut and pierce them, and other tricks for perfect crackers. It also covers some of the most used ingredients and why she chooses them. Then into the recipes. The focus is on great ingredients and flavors. The first chapter has a lot of traditional favorites like cheddar crackers, goldfish shaped mini-crackers and soda crackers. She uses yeast frequently as leavening agent instead of baking powder, and gourmet touches like alder-smoked salt make even a soda cracker very special. The next chapter is inspired by recipes from the around the world. Japanese rice crackers, my favorite rye crisps, Norwegian crackers made with oatmeal and other savories. These crackers, like the ones in the other chapters also come with dip, spread and topping suggestions. Healthful Snacks and Wheat-free crackers has several gluten-free crackers. Nut lovers will also love this chapter with things like Brown Butter-Hazelnut Crackers (my new favorite!). Quick and Crunchy uses mostly pre-made items to create crackers with flavor and snap. This is the "instant gratification" chapter, and has my daughter's favorite recipe, the Frico with Basil- made with cheese with basil from our herb garden they are fast, amazing and gluten free. Up next is a dessert chapter, which straddles the line between cookies and crackers, but still more on the cracker side. It starts with the classic animal cracker, but made for adult tastes with a lemon glaze and good ingredients. There are also recipes for a chocolate/mint cracker and some recipes that are globally inspired. Then the dips! I made the Smoked Salmon Creme Fraiche because it combines two of my favorite things with other flavors for an amazing dip. Everyone will find a good dip in here, some use seafood, there is a vegan pate, bean dips and cheese dips. There are enough dip varieties that you could make a dinner of them serving various dips with crackers and crudites. This is a wonderful book for people who love to bake and entertain. The recipes are well explained. There are not photos of every single cracker or dip, the focus of the book is the recipes. The photos shown are charming, carrying the cover theme with the crackers on a chalkboard background. Measurements are in American style volume and metric. You can get the book from Amazon.com using the links below and help support this site.